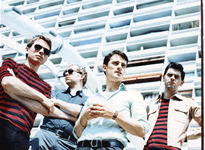 Franz Ferdinand take their love of the dance floor one step further with new album Blood. Surprisingly, it throws up some very interesting results. However, be warned because Blood is more of a curiosity than the band's usual output. It's a dub album, which basically means you get nine radical remixes of tracks from last album Tonight, rather than new material. Most of Blood is already commercially available as part of the double disc version of Tonight. What makes this version different is the inclusion of 'Be Afraid' and that it's available separately from its parent album. Unlike similar dub efforts in the past from other bands, notably fellow Glaswegians Primal Scream producing Echo Dek, Blood actually stands up on its own without having to rely on the listener already being familiar with the source material. The reason for this is because some of the drum effects used to make Tonight already originate from dub. Blood is a logical progression for these songs and the material here isn't stretched beyond recognition and turned into an ambient nightmare. Much of the credit has to go to Dan Carey who has mixed the tracks. As the producer of the original material and a protégé of the Mad Professor he effortlessly turns guitar driven songs into electronica. Many of the techniques you would expect to be used to transform the songs such as reverb, enhanced bass, and echo are all present. But none of them becomes too dependent on one particular effect. Most of the material is also under four minutes, which gives the whole album a varied feel. Lyrically Blood was never going to have the cohesion of the original material. Samples of Alex Kapranos are scattered throughout, becoming another instrument in the mix. That's not actually a problem as this is predominately a sonic experiment. If anything, the vocals anchor the listener to the original context of the song. 'Feeling Kind Of Anxious', for example, contains enough repetition of the original 'Ulysses' chorus as a reference point before it reaches a climax and literally explodes into a firework display of noise. All of the songs also reference their earlier incarnations as they have been renamed from the original lyrics. Overall, Blood is a challenging but rewarding experience. Those expecting a mainstream album should approach it with caution, but its heart is certainly in the right place.